We’ll be sharing some informative letters from our many customer’s requests. 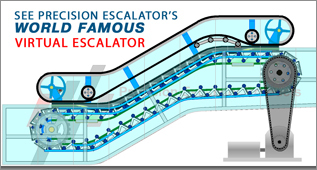 Of course you are also welcome to write to us directly, with all your escalator parts questions and interests. Our Parts Quality Controls are superior in every aspect, and it has made us your best choice for over 20 years. Buy Precision Quality Parts and Never Compromise. Our Engineering is superior in every aspect. You can’t buy a finer quality product. When you choose Precision replacement parts, you can get repairs done RIGHT the first time. Failure, can your repair team afford to fail, due to nonperformance of a single part? Have you ever calculated all the labor service costs and expenses created by repeatedly making the same replacement repairs over and over again. It’s never worth it. Down elevator and escalator time due to one small replacement part’s failure, hurts everyone.